STRIPER SOUP :: View topic - Make your predictions! Posted: Tue Sep 21, 2010 5:28 pm Post subject: Make your predictions! The zoo crew is going on a big fish mission. Jon, Eric and myself are going to team up and go for broke for 3 days at various and undisclosed locations. I will say that large striped bass (over 30 lbs) will be the target. 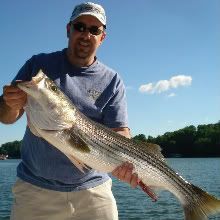 The challenge is: Post your prediction on the number of striper we will catch and release this weekend. The closest number wins, no REPEAT numbers. The winner will be announced Monday (if I have enough time and energy) and will receive a shiny new Mossy Oak Camo Soup hat! Place your bets NOW! Guesses submitted after Thursday night at midnight will not be counted! I think it will be 17 fish and the biggest coming in at 31 pounds. I'll say 14 fish with a big fish at 34lbs. 16 fish with biggest at 34 (not that we're supposed to be guessing the biggest - but it can be our side bet, or the tie-breaker in the event that no one guesses the exact #, but 2 are evenly split on either side.... and you did not say "not to exceed" or whatever). 1 fish @ 50 pds., and I aint gonna touch that rod, either!!! 12 fish with a 44lber. good luck guys and be safe. I say 21 fish and BF of 41 lbs. Posted: Tue Sep 21, 2010 10:13 pm Post subject: Humm. 3 days, various locations, targeting fish over 30lbs. Are we guessing the total number of fish or the total number of TARGETED Fish? Big fish will be 38.5lbs. Total number of fish 14, with 9 over 30 lbs. I too am going on a big fish quest this weekend. Fri, Sat, Sun, Mon & Tues. I might see ya all - though I will be hitting a single area the entire time. Im guessing 9 fish with biggest @23lbs. If ya'll stick to hunting the big girls, 8 fish and 43lbs. If you visit some of the good waters (not strictly trophy water) I would say 23 fish and 32lbs. If only one choice, 8 and 43. I did notice 14 fish had been guessed twice and 34lbs had been guessed twice. Not selling you short but 3 trophy fish in a single day is a GREAT day. Therefore I say 9 fish - all over 22 lbs. edit 1: oops - looks like 8,9,10 were picked before me so I guess my official guess would be 11.
edit 2: damn ez picked 11 - I give up. Hope you have "one of those days" 3 days in a row. Aparently some guys aren't too good at reading directions? Maybe they'll edit their response. The weather is going to change for us, so it may have a positive effect on the feeding! Let's hope so! 18 fish - big fish 43 lbs. Good luck guys! Counts 8-18 all taken so whats left? I will go with 7, but hope you catch a lot more. 19 fish when your trophy fishing sounds to high. I didn't expect this many people to get in on the action!!! I guess the point is the first one to post is the winner. Don't underestimate the zoo crew! 27 fish 32lb largest good luck guys on the back side of a fuul moon.striperman ron w.
23 fish. BF @ 33 lbs. Glad nobody put up a goose egg.